Do you have a member of household who feels a bit challenged trying to figure out what goes in which drawer? Sigh. I do. I know it’s all part of the learning process, but I thought these might help lessen the learning curve in this area. Since someone relishes removing eeeevery single article of clothing and then shrugging her (adorable) shoulders when I declare cleanup time. UPDATE: For non-DIYers, drawer stickers are available here. Before the Silhouette (aff) came into my life, I might’ve just freehanded these on colored contact paper or printed labels and laminated them and stuck ’em on. And I promise crafterhours isn’t becoming an all-vinyl-all-the-time blog, we’re just in try out the new toy mode. Albeit quite the flexible multi-purpose toy. 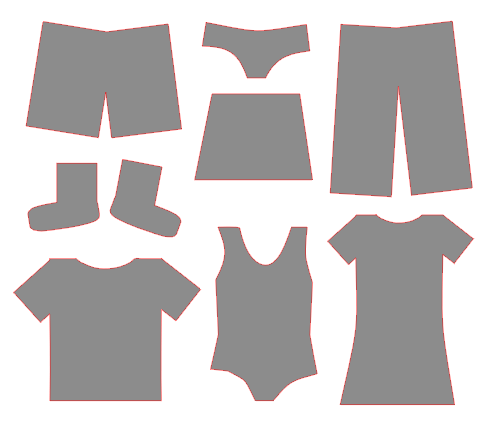 I drew the clothing outlines with the software that comes with the Silhouette. (I’m already tired of typing that word. So I’ll stop now.) It was just a bunch of rectangles and ovals and some merging and cropping. The software made it surprisingly easy. But if you don’t want to bother, here’s an image you can use to “trace” your own. I made a set for each kid. The other kid isn’t ready to deal with sorting yet, but it’ll help Gramma, too. And then they’re ready to go. 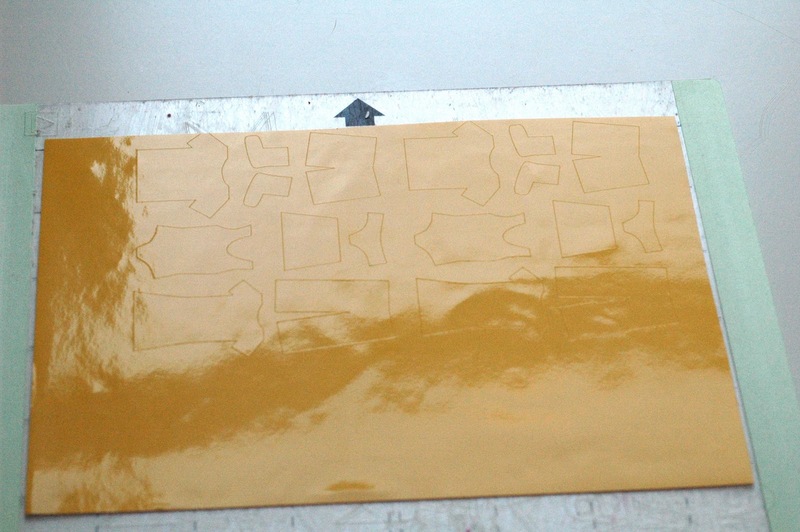 These are not tricky little pieces, so you don’t need transfer tape. Just stick ’em on and watch the magic fairies pop out and put the laundry away. Ooooooh, I wish. In this version, nightgowns and dresses are going in the same drawer, but maybe I need to cut another version of the dress with a moon and a star cutout or something? The bathing suit drawer makes me sad every time I open it now. I am ready for waaaaaaarm! Poor Adrianna has been sick for a week now, and my kids have now had their third round of stomach bugs this season. Like, 3 times in less than 3 months. On top of sniffles and coughs and a random high fever with no other symptoms. I can’t take any more! I want nap time for crafting, not for laundry and wondering whether I’m next. At least when the laundry is done we all know where it goes. P.S. Another nerdy vinyl comment. I’m not buying any more “light-tack” mats. Because after the “heavy-tack” mats are used for a while, they turn into “light-tack”mats as the stickiness wears off. Hmph. Wish I’d figured that out sooner. « Two Silhouette Shirts and Get out the vote! I’ve got one of those in my house! I am excited to put these on! Thank you! Sorry to hear about your kids being sick. It sure is not fun. I hope they will get well soon! 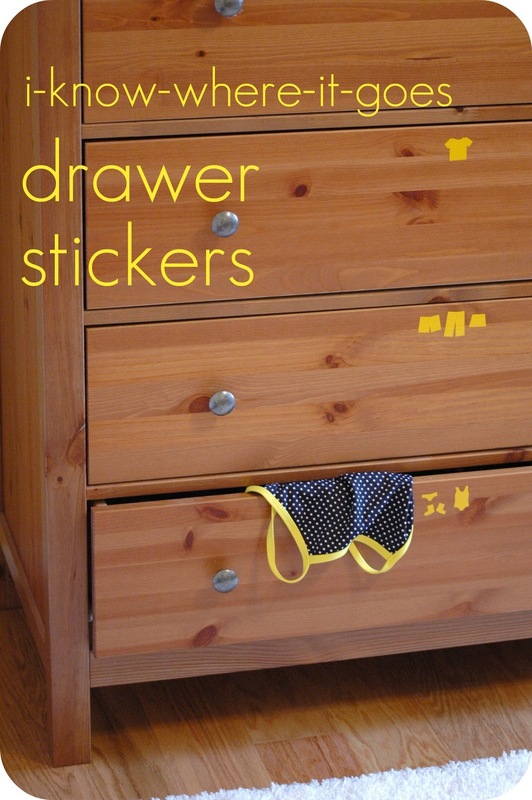 Those are some cute little stickers that you put on the drawer to figure out where things should go. That is just so much fun for little kids. So brilliant! On a not so funny note…I do hope you are all well soon! Gale, you are too funny. I am still working on getting a Silhouette so it’s fun to see what you are doing with it. Sorry about the sickies in your house. I hope it subsides soon. I been there and it’s exhausting. Very good idea! Hope everyone get well and that you’re not next. You too Adriana… Get well soon! Will you make your mom a couple of these sets for Mimi and Papi? 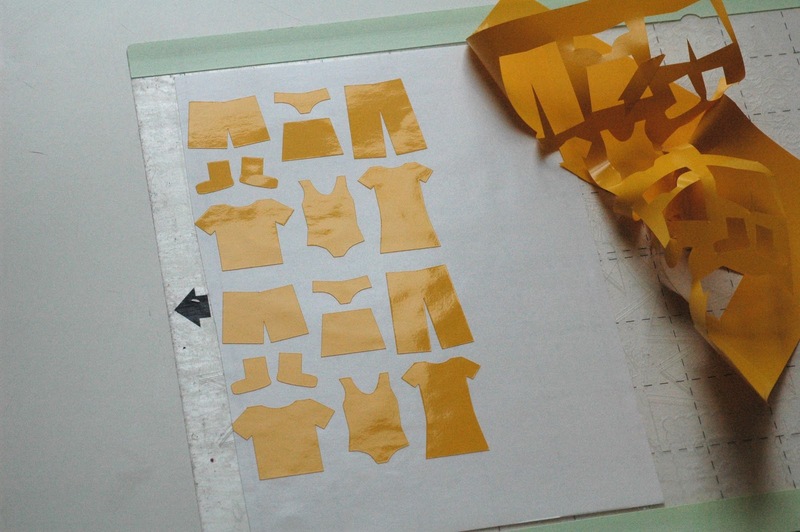 I’m going to freezer paper stencil these onto some fabric bins in my kid’s room. Fabulous! I love this idea! :o) And so cute, too! What a cute idea! I saw on a post somewhere that they named their Silhouette so they wouldn’t have to type it so much. It does become part of the family rather quickly! I have been working on this for months. I come up with really good ideas and then I don’t follow through. I have several items of clothing cut out of felt and a few are even sewn together and have velcro, but on one is actually on the drawer. Then I got a Cricut and, finding clip art online, I made the shapes to cut out. But I haven’t cut them out yet. Yesterday I went online and found photos of all the items and outfits I wanted labels for (onesies, long sleeve/pants, short sleeve/pants, short/short, pjs, etc.) and printed them out. Tonight when my little guy is in bed I am going to cut them out and laminate them and add the velcro. At not-yet-two my son isn’t putting his clothes away, but it will help the adults to know where everything is. Hopefully that project will get done. I do plan to go back and finish the felt ones. This is awesome – and just what we need around my house right now. 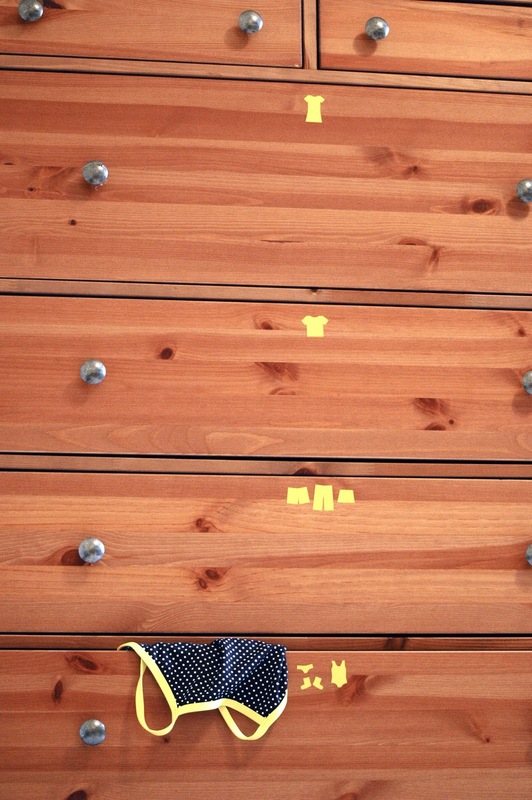 My 5 year old has been “helpful” at putting his clothes away, but always in the wrong drawers. Now there will be no more excuses: mwahahaha! I did this many, many years ago when my children lived at home. In addition to the pictures, I also wrote the word “shirts” , “pants”, etc. It helped my children learn to read, we made it a game throughout the house. “door” “window” “stove” ect.